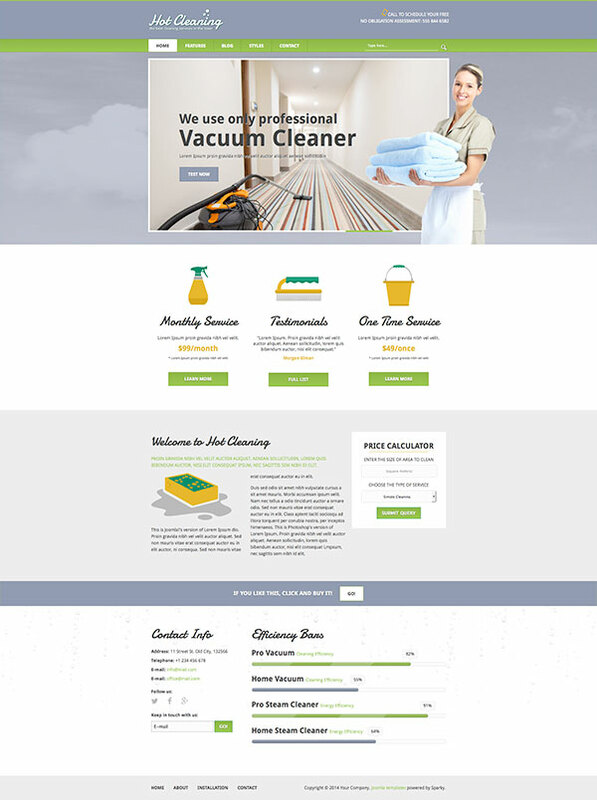 Cleaning template is a responsive Joomla template. It can be used for the development of the business websites specialized for the cleaning services. This is another template based on the Sparky Framework, powered by HTML5 and CSS3 features and also equipped with 3 new Joomla modules. 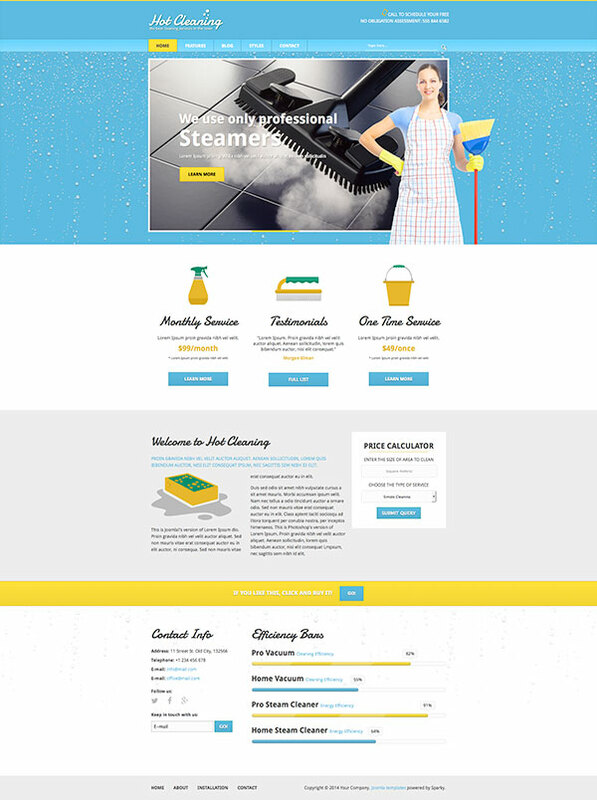 Cleaning template comes in 3 color variants that we found appropriate for cleaning agency websites. Beside the regular elements, homepage contains the Hot Elastic Slider, a new responsive module by HotThemes that displays slides with some animated textual elements, and it accommodates the layout for all mobile devices. Over this module, you can see some absolutely positioned images of women (transparent PNG images). 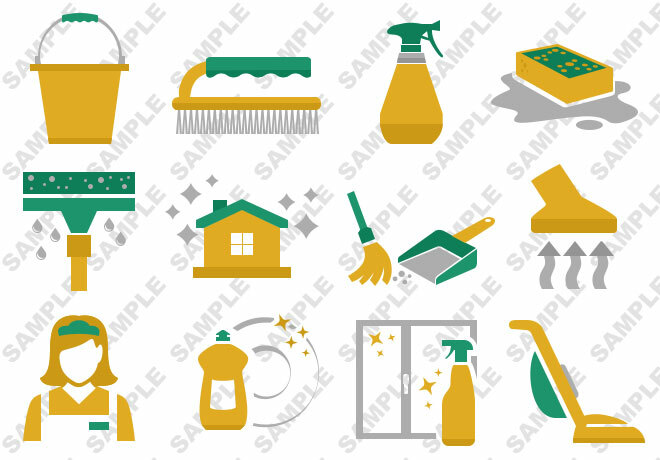 Cleaning template contains originally designed icons (vector sources are included as a PSD file). The Hot Calc module published in the right column is a simple price calculator appropriate for the calculation of the cleaning services costs. Parameters, such as area units, currency and service types are parametrized. The bottom area of the Cleaning template contains contact info and the Hot Bars module. This module shows some animated colored bars with description text. For each bar, you can select value, color, animation type and description text in the module parameters. 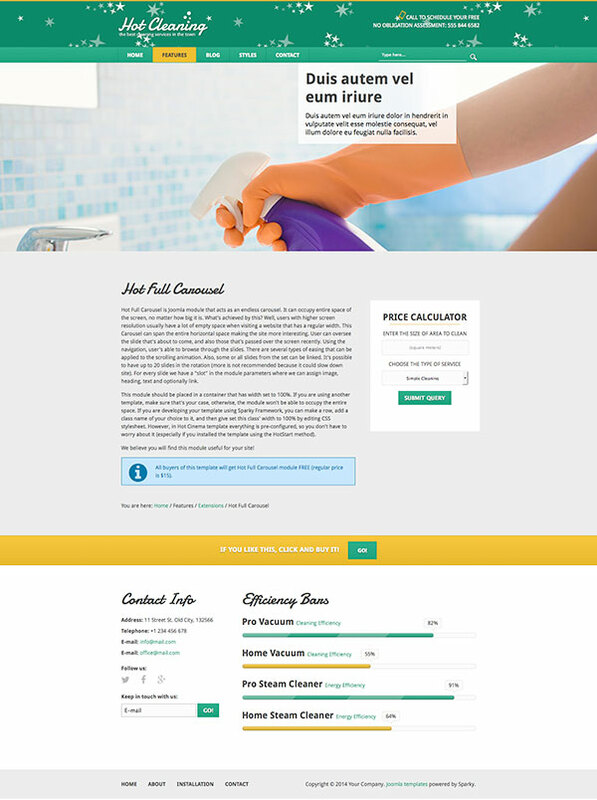 In this template, we used this module to compare efficiency between the professional and do-it-yourself cleaning methods. 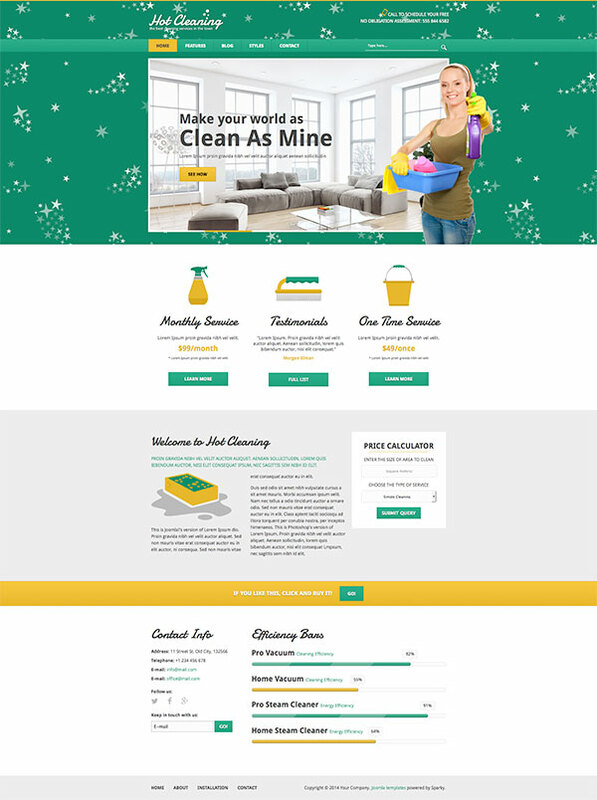 Many new features and modules that follow the modern web design practices are included in the Cleaning template. They could bring your site to the new heights! Responsive template, based on a clean HTML5/CSS3 code, and powered by Sparky Framework for Joomla. 3 pre-defined color styles. All colors are easily customizable from the Sparky options (unlimited color options). 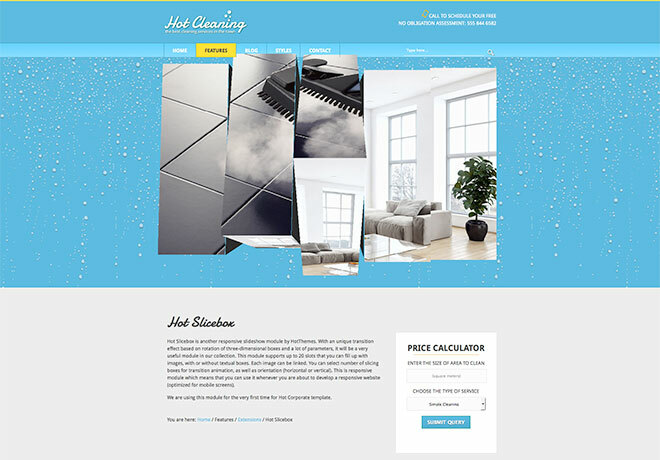 Responsive Joomla modules included: Hot Elastic Slider, Hot Slicebox, Hot Full Carousel, Hot Film Tape, Hot Bars, Hot Calc and Hot Maps modules are included with Hot Cleaning template. All commercial modules included in this template are free for you, if you buy the template (you save $15 per each commercial module). This template also includes AcyMailer Free component for newsletters. All extensions are styled, configured and ready for use with this template. HotStart (SQL dump) is available with both single purchase or membership plan. It easily copies the template files with all extensions and demo pages. PSD source file, vector icons and fonts are included.